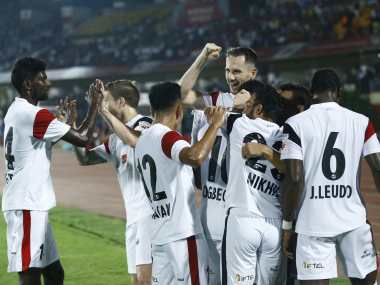 Guwahati: NorthEast United climbed back to the top of the Indian Super League after an eventful 1-1 draw against Jamshedpur FC at the India Gandhi Athletic stadium in Guwahati on Thursday. Bartholomew Obgeche (20th minute) gave the hosts early lead before Farukh Chaudhary cancelled out his strike in the 49th minute. 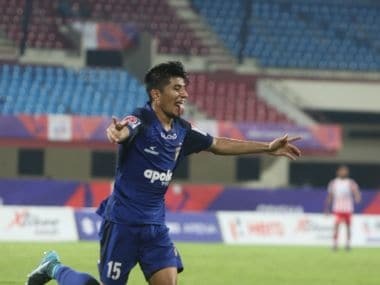 Just seconds after Redeem Tlang had forced Subrata into an excellent save, the hosts shot themselves in the foot with Komorski picking up a red card at the stroke of half-time. The Croatian defender swung his elbow wildly towards Pablo Morgado's face and the referee had no hesitation in giving him the marching orders after consulting with the linesman.